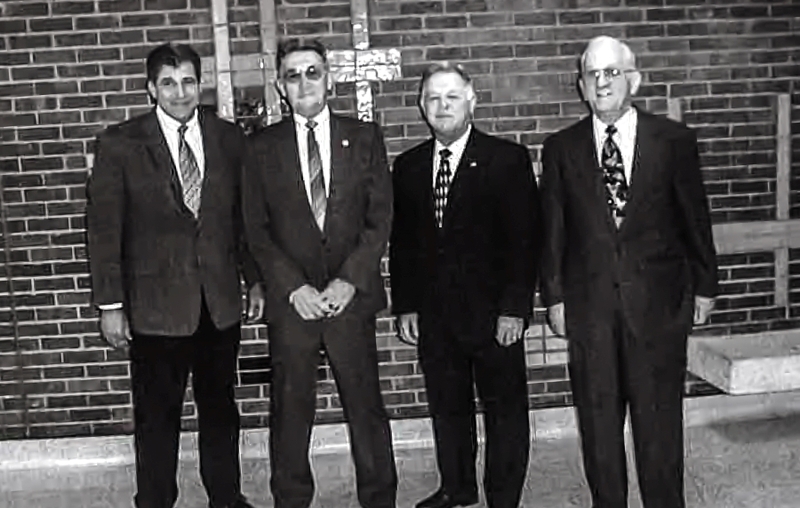 Pictured (Archived Photo) from left to right: Principal Franklin Moses and former principals Steve Jamail, Frank Braden and Jerry Ross Speer. Excitement is mounting at J. Frank Dobie High School as students, staff, alumni, current and former administrators prepare for the school’s 50th anniversary, Thursday, Sept. 13, at 6 p.m. The celebration will start with a student showcase in the auditorium at 6 p.m., followed by a ceremony at 7 p.m. and a reception in the cafeteria. During the ceremony, attendees will have the opportunity to hear from former principals: Frank Braden, who served from 1976-1988; Jerry Speer, 1988-2000; Steve Jamail, 2000-2012 and current leader Franklin Moses, 2012-present. Dobie High School was one of the final school communities to be established in Pasadena Independent School District. After World War II, Pasadena families moved to the south-southeast region of the Houston area (along South Belt) to pursue jobs in the petrochemical and aerospace industries. By 1960, it became evident that the volume of residents would grow; and the Dobie community was born. The Board of Trustees approved the Dobie High building project, which would eventually open its doors in 1968. Dobie’s original campus was formerly located where Beverly Hills Intermediate now resides. The school opened to 980 freshmen, sophomores and juniors, with 34 classrooms, two gyms and 23 industrial, vocational commercial rooms. There were also various practice halls for drama, speech, band, orchestra and choir. With the hiring of Dobie’s first Principal Allen Sory (deceased), a “tradition of excellence” began. During Sory’s tenure, Dobie’s first graduating class of six students walked through commencement in December 1969. By second semester, 226 students were handed their diplomas from Sory. Tim Georg, Class of 1970 and the school’s first Mr. Frank Dobie, remembers the school in its original form. Georg was a high school standout. He played football on the varsity team as a center and linebacker and was instrumental in helping the team win the first varsity game against Jeff Davis High School, 10-7. While most of his memories are tucked away at the old facility, he’s glad that the school lives on. “I hear stories about schools closing after a while, but to know that it is still here after 50 years is amazing,” Georg said. Football in the Dobie area wasn’t just a game. It was an event. In fact, football was how Jim met Gail, his future wife. The couple first met as freshmen during a Dobie vs. South Houston High School football game. Little did he realize back then, he would end up marrying his high school sweetheart. Sawyer, who taught in Pasadena ISD for 40 years -- 25 at South Houston and 15 at Dobie -- said the buildings may look different and the location may have changed, but the people still have Dobie pride. 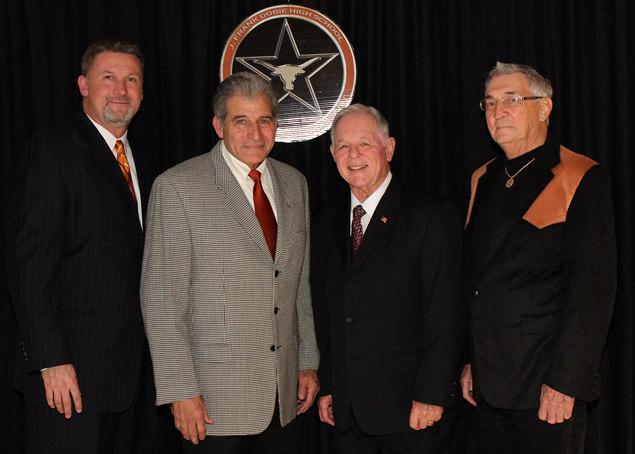 Alumni and former administrators attribute Dobie’s 50-year milestone to the unique geographical location of the school. Former Dobie Principal Jerry Speer, Frank Braden’s successor, said the location played a role in creating a close-knit community. During his tenure, the Academic Decathlon won the state and national title both in 1992 and 1996. Dobie’s Latin Club team also had its share of success by claiming the state title nearly 20 times since 1981. By the late 1990s, Dobie’s former campus had become overcrowded and the area was still growing. A new campus proposal was developed to provide adequate space for the next generation of Dobie. In the fall of 2003, with an enrollment of 2,699, Dobie opened the doors of its new campus on Blackhawk. The principal’s torch found its way to Steve Jamail, a former teacher, coach and assistant principal at Dobie, who facilitated the move to the new campus facility. Even though the building was left behind, they still worked hard to keep the Longhorn pride strong. “We worked as a team when the new Dobie was built. We had input from a lot of folks to make it feel like home, with branding and pictures placed on the walls. We talked a lot about the spirit of Dobie pride and continued to push that message to students,” Jamail said. The 50th celebration is a major accomplishment that symbolizes the community it serves, Jamail added. Pictured: An archived photo of past principals (from left to right ) Steve Jamail, Jerry Speer, Frank Braden and Allen Sory.